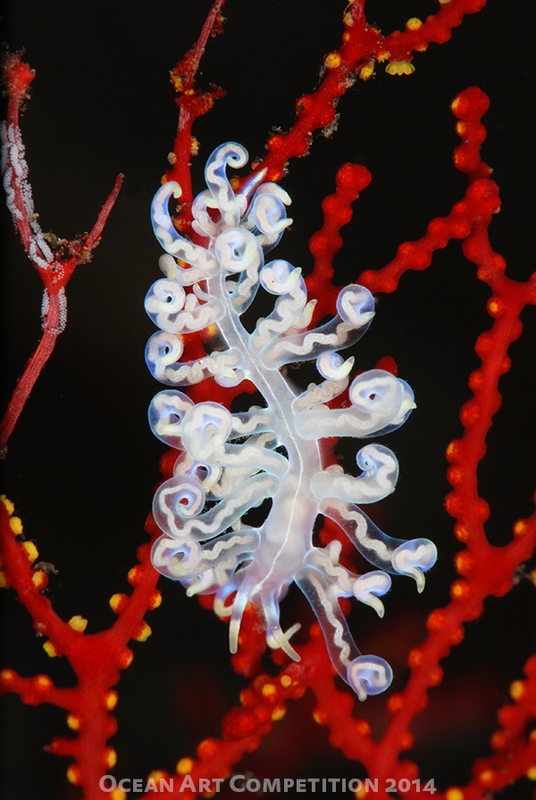 The story: This kind of nudibranch usually lives on red and orange gorgonians, such as Melithaea flabellifera and feeds its polyps, it also lays eggs on the same coral. All these facts we can see on the picture (eggs are in the top left corner of the photo). The length of the creature is about 25 mm and the photo does not cropped. In order to get that I used Subsee +10. The picture was taken at the depth 16 meters, 14.09.2014. Camera: Nikon D80, Sea & Sea housing, 105mm macro lens, Subsee +10, dual Sea & Sea YS-110 strobes.